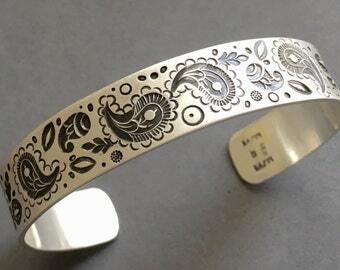 This is a nice and sturdy sterling silver cuff. It has been created using handmade stamps. 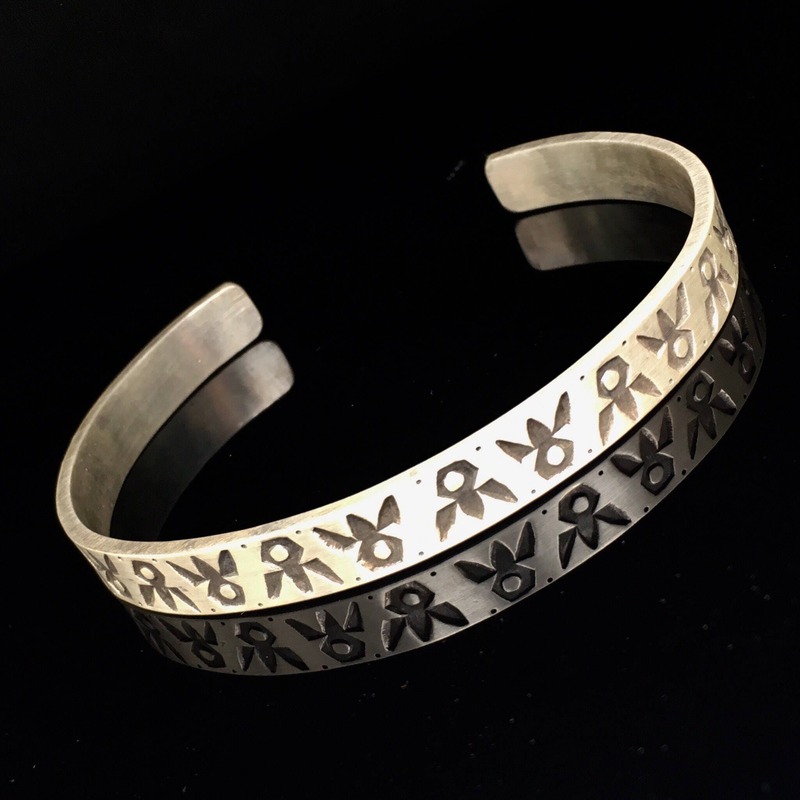 I first stamp the pattern, then shape it into a bracelet. After polishing, I give the indents a patina to highlight the pattern. This cuff is 8mm wide by 2mm thick. Measure where you would normally wear a watch, or measure your watch itself. 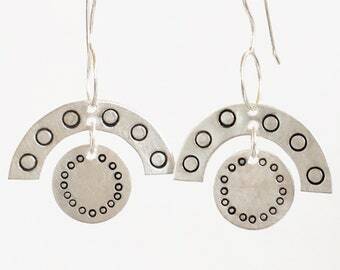 These earrings are a great addition to my jewelry wardrobe. 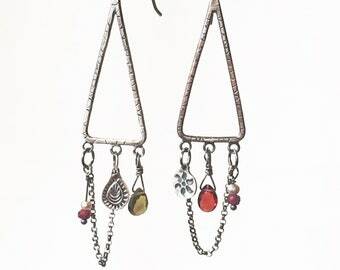 These earrings are unique, well-crafted and versatile. Sarah was kind enough to work this custom order in during the holiday season. Well made and very cute. Got compliments very first day I wore them! Paypal, direct checkout and etsy gift cards. Sales tax will be added to the states were it is required by law. All transactions are final after 30 days. If you would like to return or exchange a piece, you must do so within 30 days of delivery. No exceptions. If any piece of jewelry is damaged due to normal wear I will repair or replace it. If the piece was damaged due to neglect, I will do my best to repair it or replace it at the owners expense. I ship USPS Priority Mail with insurance for items over $100, USPS First class for items under $100. Contact me about shipping Internationally. There are new VAT tax laws that buyers need to approve before I will ship out of the US. My prices do not reflect or include any import, customs, or excises taxes that may or may not be billed to you upon receiving my product (VAT Tax etc). For this reason, it is the responsibility of the buyer to pay these fees should they be billed to them (you). 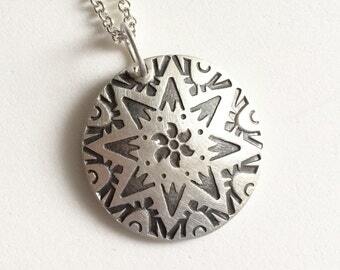 I love doing custom orders and working with people on creating new designs. A 50% deposit is required for all custom items. Item must be paid in full within two weeks of completion. If you do not know it, you can purchase a sizer from my shop. I can do my best to re-size rings, but some cannot be sized due to the design or stones involved. The best way to get sized is to go to a jeweler and have them size you. Custom items cannot be returned. Please be sure of your sizing. To properly care for Sterling Silver jewelry, give a little extra thought to how you store, wear, and polish it. 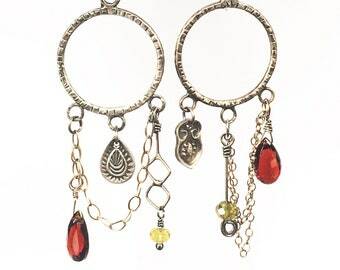 Store your jewelry in a dry and air-tight place, separating each individual piece. Wear your jewelry often, but be sure to remove it when working with certain chemicals or foods that contain sulfer. As a rule of thumb, it’s always best to put on your jewelry last when getting dressed. Polishing your jewelry before it becomes too tarnished will minimize the amount of work needed, but be sure to use the right type of cloth and stroke pattern. All of this will help keep your Sterling Silver jewelry looking brilliant for years to come. All of your jewelry purchases will be gift wrapped .